Looking to improve your speed? How well you can slow down will impact how effectively you can get up to top speed. Today’s Blog is about Deceleration Training, which is geared more towards athletes but can be related to anyone. As Rickie Bobby says, “If you aren’t first, you’re last.” Being fast is not all about how quick you can get from point A-B it also involves how well you can go from B-A. Deceleration Training is an over-looked aspect of training, especially in young athletes. “How fast you can go slow?” You may be asking yourself; What does that mean and why should I care? The deceleration phase or Eccentric phase is the step that is often overlooked. Everyone is concerned about the concentric phase or how well the can be explosive. Take a hockey player as an example. This athlete is skating at top speed, cutting, pivoting and stopping in the shortest time possible to change direction. To decrease time from the athlete’s top speed to a stop or direction change, the athlete’s body must know how to absorb energy from the momentum to efficiently slow down and maintain healthy form. By healthy form, I mean proper hip, knee and ankle alignment. As an example; if the athlete has not trained properly, the time from top speed to a stop or change of direction will go up, thus leading to a slower athlete. 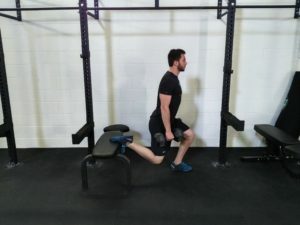 An example of deceleration training would be the dropping down portion of a RFESS (Rear Foot Elevated Split Squat). Using a tempo of 3 or more seconds to stress the eccentric part of the exercises will have further benefits of the ability to slow down. You don’t need to have weights to train the deceleration portion either. A body weight exercise could be, step off a box, say 2ft, land as softly and quietly as possible then do an explosive jump as soon as you touch the ground. This will help further how well you can slow down then go into an explosive movement. It is important to keep in mind that you do not want to fatigue your self when doing explosive movements. The purpose of an explosive movement is to do it, well, explosively. If the rest period is not adequate you might end up training a different energy system. It is important to instill the importance of deceleration training in younger athletes to help create a strong foundation to build on, as the athlete gets older and stronger. You’re only as strong as the weakest link. So lets eliminate an overlooked, yet crucial part of an athlete’s performance to help them be more efficient and effective.